How do you know if a vintage perfume is genuine? 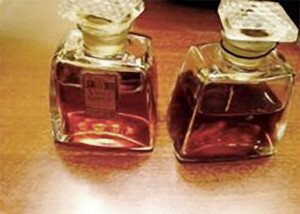 Vintage perfumes are lovely items to have in your fragrance collection. Our technical director really likes vintage perfumes. Perhaps you can help him solve a puzzle. How do you know if a vintage perfume is genuine? For this question we are considering examing L’Aimant de Coty, the bottle to the left. The bottle on the right we are told is Emeraude de Coty more of a puzzle since it has no label. We would like to receive your opinion on how to answer the question of proving that the vintage perfume is genuine. Please let us know your thoughts with a comment!